Over 500 everyday words with pictures or small scenes to make their meanings clear, and short sentences to show the words in context. Delightfully illustrated with Jo Litchfield's characterful hand-made models. 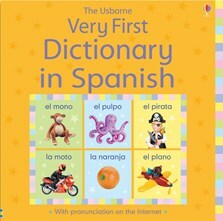 Includes simple grammar explanations, a Spanish/English word list and examples of words to use to ask questions and describe things. Children can listen to all the words at the Usborne Quicklinks Website, to hear how to pronounce them. I very highly recommend this excellent book. My 10 month old absolutely loves it. She sits on my knee for at least 15 mins at a time enjoying seeing the beautifully portrayed pictures and listening to the words in both English and Spanish. The online pronunciation help is great too. Thanks Usborne.